Camera is his first love and Flash his second and they are together right from morning till late at night. Favourite of all celebrities, he has been shot with the who’s who of Bollywood. 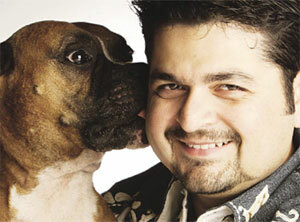 Yes, we are talking about the famous fashion photographer Dabboo Ratnani and his Boxer friend ‘Flash’. “Flash generates positive energy and adds life to the studio. He gives an enthusiastic welcome to all models and celebrities. With his charming look and temperament, he wins the hearts of even those who are scared of dogs. He is an intelligent dog and he knows when he has done wrong and he does not repeat it again. He is as happy and excited to see us as he was at the first meeting. His response never changes. 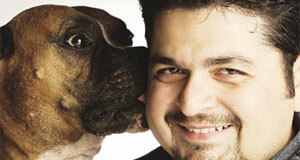 Perhaps my ability to understand every move of his, is cherished most by Flash,” tells Dabboo Ratnani proudly. His cute smile makes most of us go weak in the knees…but what catches his fancy is not us…but his loved pets-Princess (GSD), Simba (Chow Chow) and Ashley (African Grey). “They all are close to my heart and we all love them equally. I particularly like their ‘Unconditional Love.’ They are very affectionate and loving, and my Chow is a real handsome dog… he is a stunner. A responsible pet parent should groom their pets regularly and brush them at least once a day. Never over feed them and giving them leftovers is a big ‘No No.’ Make sure that pets are getting healthy and nutritious diet as per their requirement. And just shower all the love and care on them,” tells Madhavan smiling. Kapil discovered his love for canines when his wife Romi brought home two lovely Dobermans – Don and Pachino. They went on to have six cute-looking four-legged ones in their home. “We have six furry canines and they all have settled into our family. Each one is like a child and has their own typical character and habits. The moment I see the menace, I can tell who is responsible for it. Each one is cute in his own way and we will not trade them for anything. Don’t keep a dog unless you are sure. Love your dog as they are sensitive and know when they are neglected. Give them a lot of physical and mental exercise and you will have a happy tail-wagger at your side,” tells Kapil Dev. Priya Dutt is owned by her pet dogs Prince and Mauzer. “Prince came into my life quite by chance, eight years ago, when he was just a tiny little ball of fur. I had agreed to babysit him for my brother. At that time, I was going through a very confusing and difficult time, both career-wise and personally, and the arrival of Prince completely changed my life. He almost helped heal me and he is like an angel and my closest and unconditional friend,” tells Priya affectionately. “Mauzer is a Siberian Husky and is quite a handful. He is very playful and hyper but also extremely affectionate in his own way. Every time I come home, he wants to beat Prince at greeting me. So often there is a commotion but now they have learnt to happily co-exist with each other,” adds Priya with a twinkle in her eye. Arjun Rampal & Mehr Jessia is one such couple who not only share a beautiful relationship, but also love their pets Tyson and Demi (both Boxers) to the core of their hearts. “Pets are special, and blessed are people who love them. They teach you so much – especially understanding, love, patience and communication. They are like children and unconditional love that they express is outstanding. They communicate with you and always try telling you a lot of things. I share an extraordinary affinity with my pets. What you experience with your pet is very different to what anyone will experience with humans,” expresses Arjun Rampal. Mandira is smitten by pooch love. She has four pets: Buster (Basset Hound), Bonzo & Hulk (both Yellow Lab), and Blue Berry (Golden Retriever). “Our dogs love to party during weekends, they play endlessly and make merry. They never give me a tough time. Me and my husband love dogs, we can’t imagine our lives without them. Sometimes when I am feeling little sad, they just come to me and put their legs on my lap and stare in my eyes as if asking…is everything fine? And believe me, my worries just fade away. Dogs need nurturing, care and love. And when they get these…they revert back with the same in a big way…they are truly a human’s best friend,” tells Mandira.